The Most Recognizable Flags in the Confederacy? 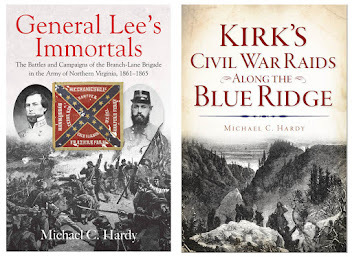 Did the Branch-Lane brigade have the most recognizable flags in the Confederacy? Quite possibly. 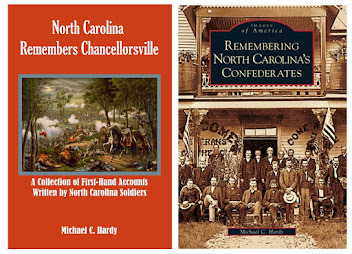 On the front cover of my new book is the "Branch pattern" flag of the 18th North Carolina Infantry. It is a standard 3rd pattern Army of Northern Virginia flag, with battle honors painted in a distinct white scalloped style. As far as I can tell, no other ANV infantry regiment ever had such a distinctive style flag. The flags of the 3rd, 13th and 15th South Carolina are similar, but not enough to attribute it to the same painter. The battle honors are not as bold. Following the Seven Days battles, Brig. Gen. Lawrence O'Bryan Branch was authorized to have new battle flags inscribed with the regiments' battle honors. The quartermaster was responsible for furnishing flags to the brigade. The flags of the 7th, 33rd, and 37th regiments were authorized to be emblazoned "New Berne, Slash Church, Mechanicsville, Gaines Mill, Fraziers Farm, [and] Malvern Hill." The flags of the 18th and 28th regiments were embellished with "Slash Church, Mechanicsville, Gaines Mill, Fraziers Farm, [and] Malvern Hill." When the flags of the regiment were issued to the brigade in December 1862, the battle honors had undergone some changes. Instead of "Slash Church," the flags now had Hanover. Gaines Mill was now Cold Harbor. Other honors were listed as well, including Cedar Run, Manassas, Manassas Junction, Ox Hill, Shaprsburg, and Harper's Ferry. According to the compiled service records, the flags arrived in camp in early December 1862. Captain George S. Thompson, quartermaster for the 28th Regiment, signed for his regiment's flag on December 4, 1862. The statement reads "One Battle Flag with inscription." That's an important little fact. I would take it to mean that the flags arrived in camp, from Richmond, already painted with their battle honors. Obviously, there was some discussion from the time that Branch requested the flags, until when they were actually painted (after September 1862) with someone at the Quartermaster's Department. The brigade, now belonging to James H. Lane, carried these flags through the battles of Fredericksburg and Chancellorsville. The 18th NC lost its flag at Chancellorsville. Glen Dedmondt writes in his book, The Flags of Civil War North Carolina, that A. P. Hill's division was issued new flags in June 1863. The 7th NC obviously stuck their "Branch" flag back in a wagon. Their new flag was captured on July 3, on the slopes of Cemetery Ridge by a member of the 1st Delaware Infantry. The 28th North Carolina also lost a flag, but not the new one. Their Branch flag was captured on July 3. Dedmondt believes the 33rd NC carried its new flag through the Gettysburg campaign, until it was captured at the Wilderness on May 6, 1864. So the Branch pattern flag of the 18th was captured at Chancellorsville, and that of the 28th at Gettysburg. The 37th North Carolina's Branch flag was captured on April 2, 1865, as the Federals overran the breastworks below Petersburg. The 33rd North Carolina's Branch Pattern flag was supposedly in Battery Gregg as the fighting took place. It was captured at some point after April. So what became of the 7th's Branch pattern flag? The 7th NC had been ordered back to North Carolina in February 1865, to try and help round up deserters. Instead of surrendering their flag, the men cut it up, each taking a piece of it home with him. This seems to be a common practice with Army of Tennessee regiments. Pieces of all three flags survive. A fragment of the 7th NC's Branch pattern flag is at the North Carolina Museum of History, along with the 18th NC's Branch pattern flag. The Branch pattern flags of the 28th, 33rd, and 37th Regiments are at the Museum of the Confederacy. Back to my original argument. I would say that the Branch pattern flags of the Branch-Lane brigade are the most distinctive depot-issued flags of the Army of Northern Virginia. 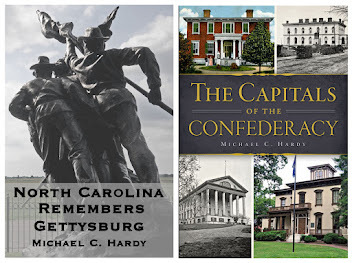 Thanks to Charlie Knight of the North Carolina Museum of History for help with this post. Help save one of the Bethel Regiment's flags! Preserving flags is no small undertaking. A wool bunting flag can cost several thousand dollars. A silk flag, $20,000. States and museums rarely have that kind of money lying around, so it is up to individuals and groups to raise the funds to have the flags sent to conservators for preservation. When it comes to silk flags, time is of the essence. Friends in the McDowell Men, Camp 379, Sons of Confederate Veterans, have taken it upon themselves to raise the funds to preserve the flag of Company E, 1st North Carolina Volunteers, the Buncombe Riflemen. The Buncombe Riflemen were organized on December 20, 1859, in Asheville, North Carolina. Locals were afraid that other fanatics, like John Brown, would follow in his footsteps, raiding government property, kidnapping local citizens, and inciting civil insurrection. Later, the name of the private militia company was changed to the Buncombe Rifles. With hostilities looming between the North and South, the Buncombe Rifles were ordered to Raleigh in April 1861. The flag above was reportedly made by Miss Anna and Sallie Woodfin; Miss Fannie and Mary Patton; Miss Mary Gaines, and Miss Kate Smith. The flag was made from silk dresses belonging to the young ladies, and was presented to the company by Anna Woodfin. Capt. William McDowell accepted the flag on behalf of the company. The Buncombe Rifles became Company E, 1st North Carolina Volunteers, on May 13, 1861. It is believed that Company E became the color company of the regiment, and that this flag flew over them as they fought the Federals at the battle of Big Bethel, Virginia, in June 1861. That distinction would make this banner the first flag to see land combat operations during the war. Later, the General Assembly authorized the regiment to inscribe the word "Bethel" on the flag. The first North Carolina Volunteers was mustered out of Confederate service on November 12, 1861. The flag now resides at the North Carolina Museum of History. Charge of the 5th NY at Big Bethel. Note flag at upper left. Due to the fragile nature of silk flags, if steps are not taken soon to stabilize and conserve this banner, it will be lost to history for good. 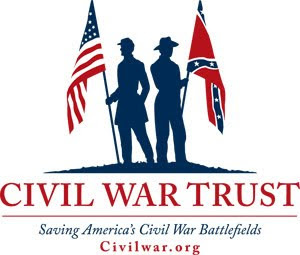 Please visit Camp 379's website for more information, including how to donate to help preserve the flag of the Buncombe Riflemen. 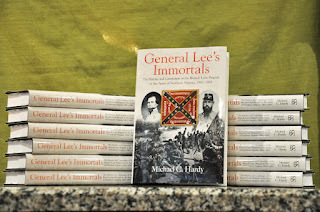 In case you missed the facebook announcement, I received my first case of General Lee's Immortals yesterday. The rest will arrive next week, and I'll be getting orders out then. If you have still not ordered a signed copy, please visit my store page. 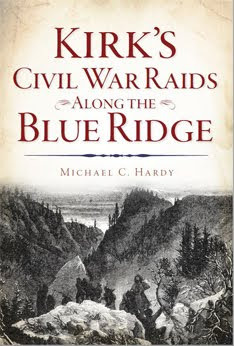 On the inside back cover is a blurb about yours truly: "Michael C. Hardy is a widely recognized expert and author on the Civil War." This is something that the great folks at Savas Beatie wrote. "widely recognized expert" are the three words that I'm trying to wrap my head around. Have I reached the "widely recognized expert" stage? Perhaps.... 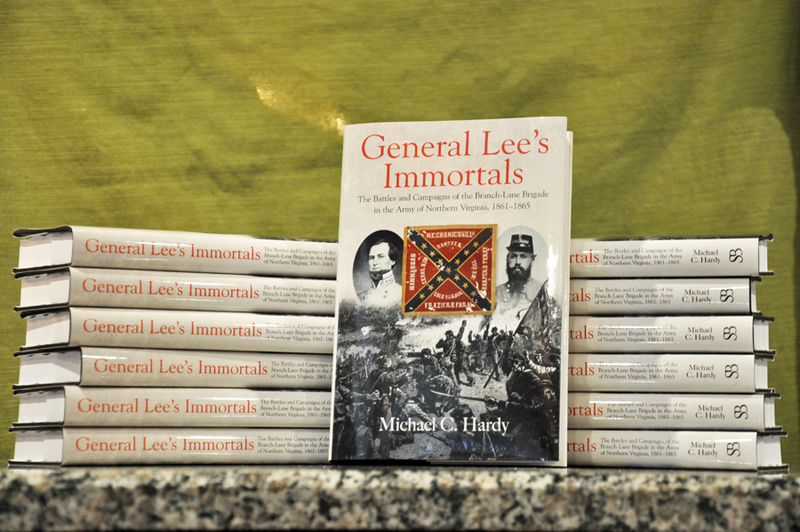 I guess... With General Lee's Immortals being my twenty-second book, maybe? I've never been hung up on titles. I don't have a wall of fame in my office that showcases some of the awards y'all have so graciously bestowed upon me. I don't even have my diploma from Alabama framed. 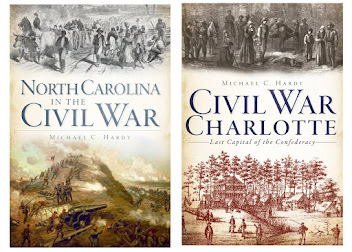 I was in awe several years ago when someone reviewing my book on the 58th NC considered me a "veteran Civil War writer." "Veteran Civil War writer" I get. With twenty-two and soon to be twenty-three books in print, I get the veteran part. "Widely recognized expert?" I'll be the first to say that there is a whole lot I do not know about the time period. I've never read a book on Phil Sheridan (sorry Eric Wittenburg), or Hannibal Hamlin, or anything dealing with the Trans-Mississippi department. Last year’s foray into the legal side of American history has taught me much. And there is so much more to learn, to read through, to talk about. Oh well, I guess I'll keep digging. I'm quite certain there is something fresh on that next page I'll be turning over. Thomas Ruffin and the Confederate States of America. Is it possible to be in favor of a new country (the Confederate States of America) and not be a believer in secession? Yes, it was. Thomas Ruffin was one of those individuals. Most folks are probably more familiar with Thomas Ruffin's more famous, historically speaking, cousin, Edmund Ruffin. Edmund Ruffin was an agricultural reformer and Southern national who championed Southern independence. He supposedly fired the first shot at Fort Sumter, and after the demise of the Confederacy, committed suicide. Many years ago, I read Edmund Ruffin's diaries (three volumes, if I remember correctly). It was an interesting reading list, to be sure. Thomas Ruffin is an entirely different story. Ruffin was born in Virginia in 1787. He graduated with honors from the College of New Jersey (now Princeton University) and moved to Orange County, North Carolina, in 1807. He finished studying law in 1808, served in the General Assembly in 1813, and as Speaker of the House in 1816. Later that year, he was appointed a superior court judge. Ruffin resigned in 1818, but he was reappointed in 1825. In 1829, he was appointed to the North Carolina Supreme Court, and in 1833, was appointed Chief Justice. After twenty-three years on the North Carolina Supreme Court, Ruffin retired in 1852, returning to his plantation on the Haw River in Alamance County. He was later mentioned as a possible U. S. Supreme Court nominee, but declined. When the Secession debates began, Ruffin was "a moderate voice in support of compromise and conciliation" (Huebner 155). He was the senior member of the Peace Conference in Washington, D. C., in early 1861. "I came here for a purpose which I openly and distinctly avow. I proclaim it here and everywhere. I will labor to carry it into execution with all my strength and ability which my advanced years and enfeebled health have left me... I came to maintain and preserve this glorious Government! I came here for Union and peace!" he was recorded as saying (155). Many of the delegates supported Ruffin's views. J. G. de Roulhac Hamilton, The Papers of Thomas Ruffin (especially volume 4). Is it possible to read both broadly and deeply into one subject? 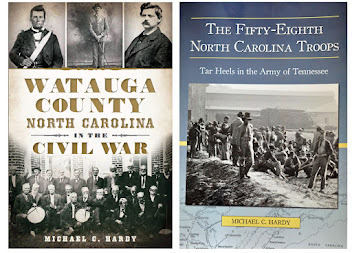 Early in 2017, because of my interest in the life of North Carolina Chief Justice Richmond M. Pearson, I set out to read both broadly and deeply into American legal history. I wanted to know more about the lives and work of American jurists. I guess this quest actually started in 2016, when I read Lawrence Friedman's A History of American Law and Joe Meacham's American Lion: Andrew Jackson in the White House. Friedman's book has its interesting parts as well as some that are less so(I could never be a corporate or property lawyer). Meacham's biography of Jackson was quite interesting. In 2018 came Cliff Sloan and David McKean's The Great Decision: Jefferson, Marshall, and the Battle for the Supreme Court. This was a fascinating tome, and, at some point in the future, I want to dive more into the life of John Marshall. Next came John Quincy Adams: Policymaker for the Union by James E. Lewis, Jr. I had read on John Adams before (queue up David McCullough's voice), but never anything on his son, except in other texts. Like John Marshall's work on establishing the Supreme Court as an equal branch of government, John Quincy Adams really established the state department. Next came Maurice G. Baxter's Henry Clay: The Lawyer, a book I've had for a number of years (published in 2000), but never read. Lawyers in 19th century America practiced all kinds of law, all at once. But they also developed specialties along the way. Clay specialized in real estate law. Next, I turned my attention to Abraham Lincoln, picking out two books from the tens of thousands on this one man. The first was a collection of essays edited by Roger Billings and Frank J. Williams entitled Abraham Lincoln, Esq. : The Legal Career of America's Greatest President. The title should have given it away: this book was dreadful. Only two of the essays were really quality material (and I don't even remember what they were). One thing I did pick up was that Lincoln excelled in collecting debts. For example, some backwoods store owner would order merchandise from a New York wholesaler and when he did not pay, the wholesaler would hire Lincoln to collect. A much, much better book was James Simon's Lincoln and Chief Justice Taney. Once again, this was a book I have had for some time (published in 2006). 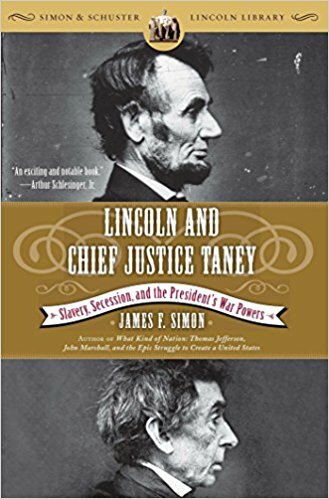 This was a superb read, comparing the lives of Lincoln and Roger Taney. At some point, I would really like to dig more into the life of Taney. Then came Timothy S. Huebner's The Southern Judicial Tradition: State Judges and Sectional Distinctiveness, 1790-1890, a book of essays on six different judges. I was most interested in Thomas Ruffin (yes, cousin to Edmond Ruffin). 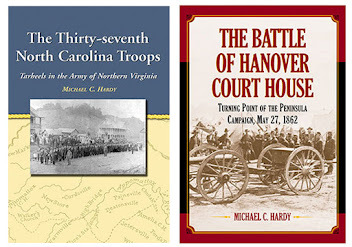 Thomas Ruffin had retired from the North Carolina Supreme Court by the time of the war, but did play several interesting roles during the conflict. We'll probably look more into his life in a future blog post. 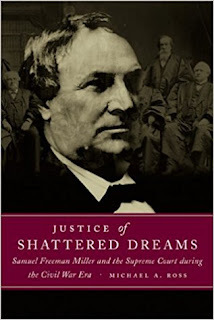 Finally came Justice of Shattered Dreams: Samuel Freeman Miller and the Supreme Court during the Civil War Era. This book (I'm about half way through) is superbly written. It has some of the best summaries of national events, like the Kansas-Nebraska Act, that I recall seeing. Miller was one of the five justices that Lincoln appointed to the US Supreme Court during his presidency. He was a slave-owning Kentucky doctor before giving up on the institution and moving to Iowa to practice law. Miller believed that Southern leaders who attempted to start the Southern Confederacy should have been hanged or driven into exile. So, it is possible to read both broadly and deeply? Yes. I read broadly into American history in 2017, coving over 90 years of the past. But I have also read deeply, looking specifically at lawyers and legalities, men and events that influenced American history. What's next? I'm not sure. Several times in my life, I have taken huge chunks of time to read on a certain subject or individual. I once spent two years reading on Robert E. Lee. I've already confessed that I would like to read more on Marshall and Taney. I have William M. Robinson, Jr.,'s Justice in Grey: A History of the Judicial System of the Confederate States of America, a book I have never read. (It's huge - almost 700 pages.) 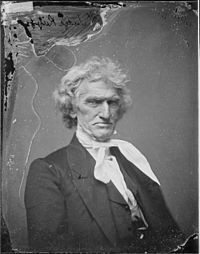 I'm very interested in the life of John A. Campbell, a sitting US Supreme Court Justice who resigned his seat at the start of the war, went back to Alabama, and was then appointed the Confederate Assistant Secretary of War. I also have several books I've collected over the years on more recent justices and courts. I originally thought I would spend 2018 looking more into 19th-century science, but maybe I'll hang out in the legal world a little longer.